Sunline Siglon PEx4 is a 4 carrier braided line that packs a punch without breaking your wallet. Some of the highest quality materials go into making this braid that has the strength to guarantee your confidence. Sunline Siglon PEx8 is an 8 carrier braided line that packs a punch without breaking your wallet. Some of the highest quality materials go into making this braid that has the strength to guarantee your confidence. 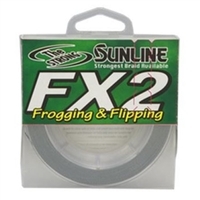 Sunline FX2 is designed for two things: frogging and flipping. It is an 8 strand braid with a smooth circular shape to fill your reel more evenly and cast further and quieter. These characteristics along with the abrasion resistance make this the strongest braid available. Sunline SX1 is the perfect braid for the lighter casting and spinning applications. Important characteristics are low stretch, excellent abrasion resistance, no exterior coating that will wear off over time, and ultra high sensitivity.